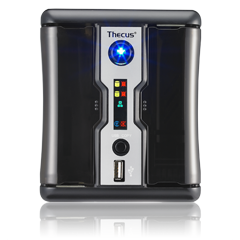 The N2200 is ideal for storing your entire collection of digital media. 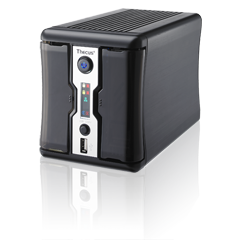 With capacity for two 3.5” SATA hard disks, the N2200 can easily accommodate up to 4TB of storage. 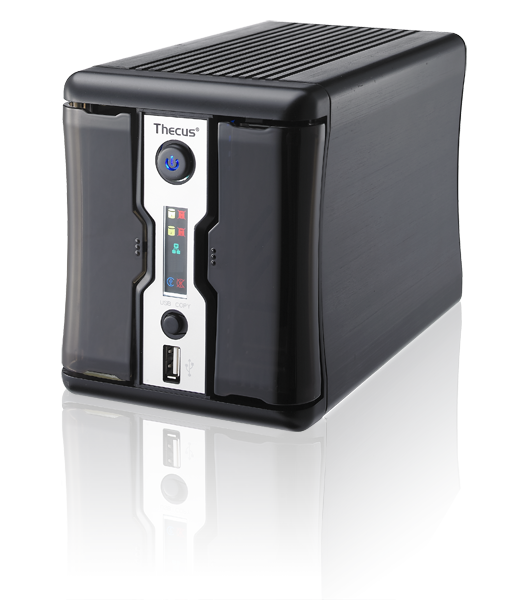 For added flexibility, the N2200 is equipped with combo disk bays, which means it can also accommodate 2.5” SATA hard disks! 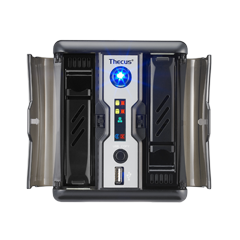 To keep your data safe, the N2200 also offers several RAID modes including RAID 0, 1 and JBOD. 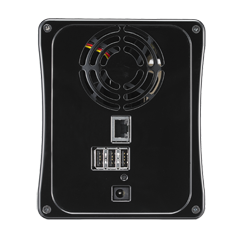 If you need to change out your hard disks, the N2200's hot swap, hot plug, and auto-rebuild capabilities make swapping out hard disks a snap. Wondering how your N2200 is doing? 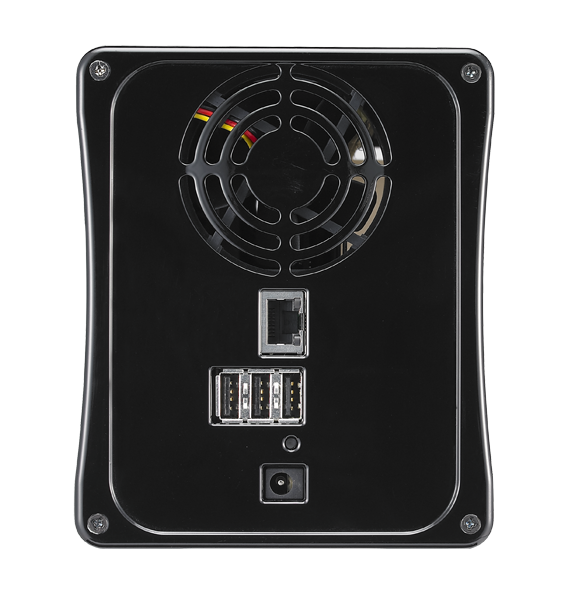 Get system status updates at-a-glance with the N2200's easy-to-read LCD, which displays intuitive icons to show you system information including hard drive access, LAN connectivity, and USB copy status. 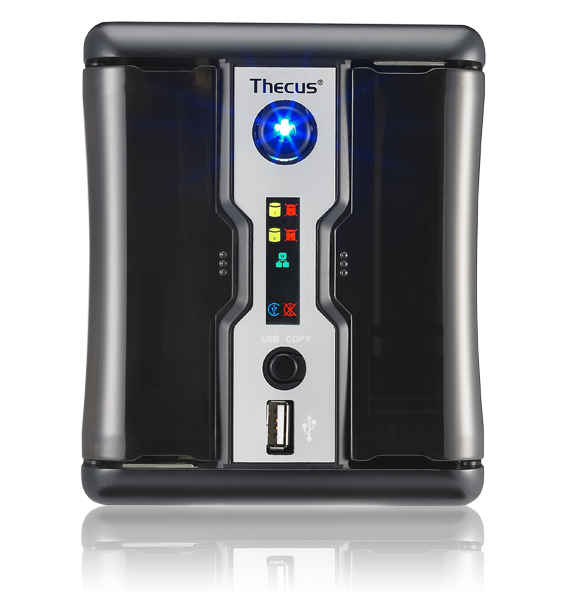 And because high tech shouldn't mean high difficulty, the N2200 even comes with a handy Thecus® Smart Utility that not only backs up your files, but also allows you to install the N2200 with a single click! Managing your own NAS server just doesn't get easier than this. But the N2200 is a lot more than mere storage – it also comes with a bevy of friendly features to make it the center of your digital lifestyle. Included with the N2200 is an upgraded Download Manager, which not only supports HTTP and FTP downloads, but also BitTorrent and eMule as well! New to the N2200 is dual cam support, which enables you to connect both IP cams and USB webcams to it to assemble your very own simple surveillance server. In addition to this, the N2200 comes with full multimedia support, with an iTunes server, Photo Web Server, and even media streaming via uPNP, making it a wonderful addition to the living room. 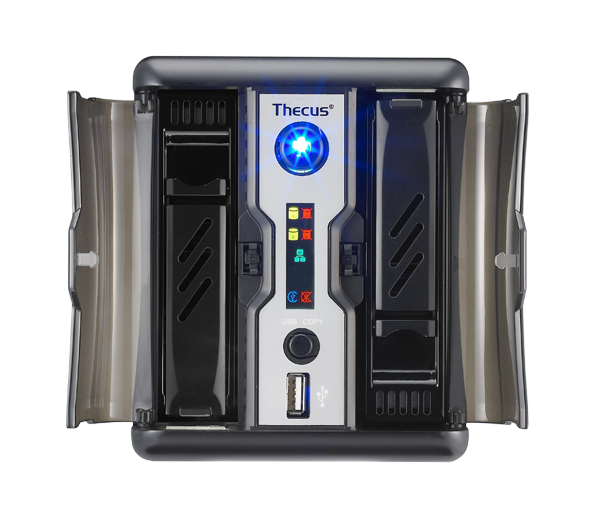 The N2200 is also very energy efficient, consuming considerably less power than a full on PC, and operates super-silently so you won't even know it's there. Best of all, the N2200 brings all of these great features in a very affordable package.